A recent project used radiogenic isotopes to study the provenance of eolian terrigenous material deposited in the subtropical eastern Atlantic Ocean off NW Africa. We are using Sr, Nd, and Pb isotope ratios and major and trace elements to constrain changes in the supply of dust over the last two glacial to interglacial transitions. This work broadly impacts our knowledge of how low latitude terrestrial environments responded to major climatic shifts. This research is published in Earth and Planetary Science Letters (v. 278, pp. 257-266). New projects are focusing on cores dating to the Miocence and Pliocene in the Arabian Sea off eastern Africa and late Holocene cores off NW Africa. Changes in ODP Site 658, Hole C sediment compositions over time. Age depth model from deMenocal et al. (2000, Science), terrigenous percent data from deMenocal et al. (2000, QSR), and 230-thorium-excess normalized terrigenous flux data from Adkins et al. (2006, Paleoceanography). Large and abrupt changes in the high-resolution strontium isotope record mirror changes in the percentage and flux of terrigenous material at the site. Neodymium isotopes remain essentially constant over the record, suggesting that general geologic provenance has not appreciably changed. Cole et al., 2009. EPSL, v. 287, pp. 257-266. A review of applications and techniques of U-Pb carbonate dating was recently published in Reviews of Geophysics (v. 47, RG3001, doi:10.1029/2007RG000246). My PhD research used U-Pb dating of sedimentary carbonates as a tool for constraining time in the sedimentary rock record. Petrography and trace element analysis are important components of understanding what samples are the best candidates for accurate and precise dating, and were a focus of much of this research. Some results are published in Sedimentology (v. 51, is. 3, pp. 433-453). I have studied lacustrine tufa deposits from the Miocene deposits of the Barstow Formation, California. We were able to obtain ~16 million year old U-Pb calcite ages with a precision of 1% of the age. These results are published in Geological Society of America Bulletin (v. 117, is. 3/4, pp. 276-287). I am also interested in applying U-Pb to date Quaternary sedimentary calcite. I am working on samples of lacustrine calcite and root casts from archaeological sites in East Africa. Schematic stratigraphic sections and U-Pb calcite ages from the Barstow Formation. All age uncertainties are shown as 2s. Left panel: Rainbow Basin Ar-Ar ages of the Red, Rak, and Dated Tuffs (MacFadden et al., 1990). The K-Ar age of the Skyline Tuff is from this section as well (WoldeGabriel et al., 1996). Center panel: Our measured section from the south limb of the syncline in Owl Canyon. Tufas are exposed on a ridge southwest of Owl Canyon Campground. This locality is 260 m below the Skyline Tuff and is marked with a star. U-Pb ages for three tufas in italics. Right panel: The section between Owl and Solomon Canyons is the lithostratigraphic type section for the Barstow Formation and was measured on the north limb of the Barstow syncline (Durrell, 1953). The position of the phytoherm tufa locality on the north limb of the syncline is estimated on this section with a star. U-Pb tufa age in italics. Cole et al., 2005. GSAB, v. 117, pp. 276-287. This research was published in Chemical Geology (v. 193, is. 1-2, pp. 127-136). This study was part of an undergraduate research project conducted by Jessica Nienstedt. Our samples were analyzed by the University Microscopy Imaging Center at the University Hospital and Medical Center at Stony Brook. Phosphor imaging is a type of digital autoradiography that maps the distribution of U and Th in rocks and minerals. We have used this technique to aid in sample selection for U-Pb dating and synchrotron X-radiation studies. 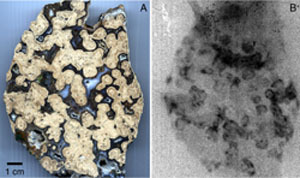 Example of phosphor imaging. A. Slab of tufa phytoherm from the Barstow Formation, California. Sample is composed of brown laminated calcite framework, dark green and red sparry calcite, and translucent white chalcedony. Scale bar is 1 cm. B. Corresponding phosphor image. Darker areas represent areas of higher U concentration. U is enriched in the laminated framework. Cole et al., 2003, Chem. Geol., v. 193, pp. 127-136.